Sighting in and Target Practice. I drove down to Illinois this past weekend to see my newest family member. My sister had a little girl two weeks ago. I hung around with her for a while and distracted my nephew so sister could do human things like nap and shower. But after a while, everyone was tired and I decided to clear out. I took the dog to my mom’s house, and after a quick hike to the river to let him swim and catch crawfish, I got my new sight zeroed in and did some practice shooting. 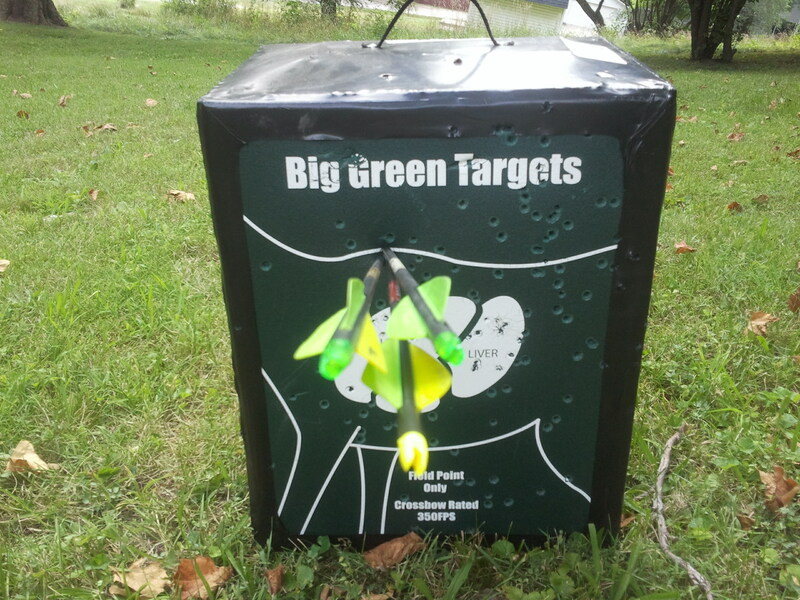 Target at about 15 yards. Shot a little high at 15, but my grouping is excellent. Adjusted the sight after this. I can remember shooting every day after school for hours when I was a kid. With a longbow, and no let off point. My arm, in spite of being stronger, doesn’t have the endurance anymore. 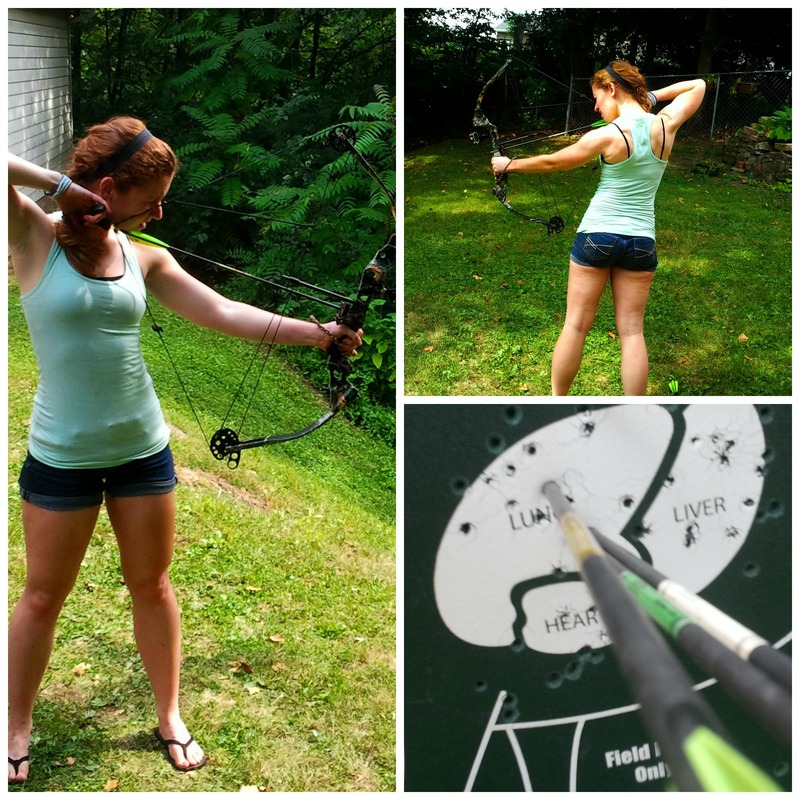 So I decided that since our neighbors that had kids moved out, and since my bow is dialed in pretty well (no wild arrows flying into their yard, field point or no), I’m going to set my target up in the backyard to shoot at when I have time. 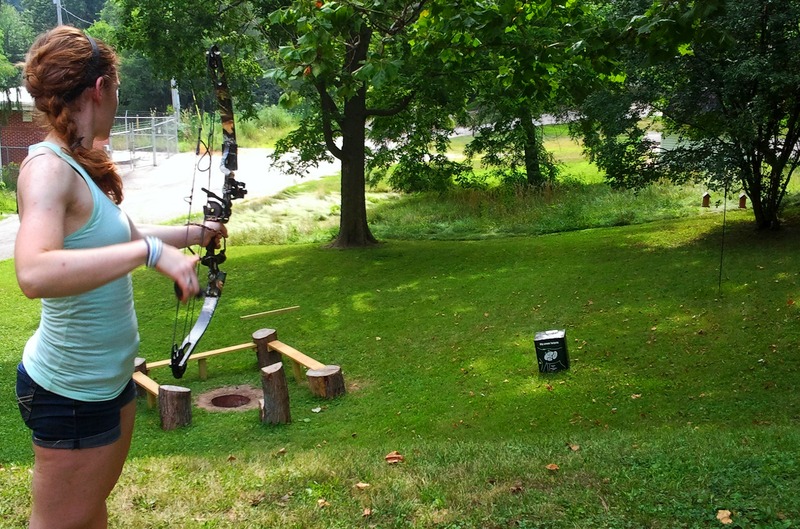 Our yard is not huge by any means, but practicing at 20 yards is much better than nothing. I might look a little bananas standing on the roof of the garage to practice elevated shooting, but I do need the practice. 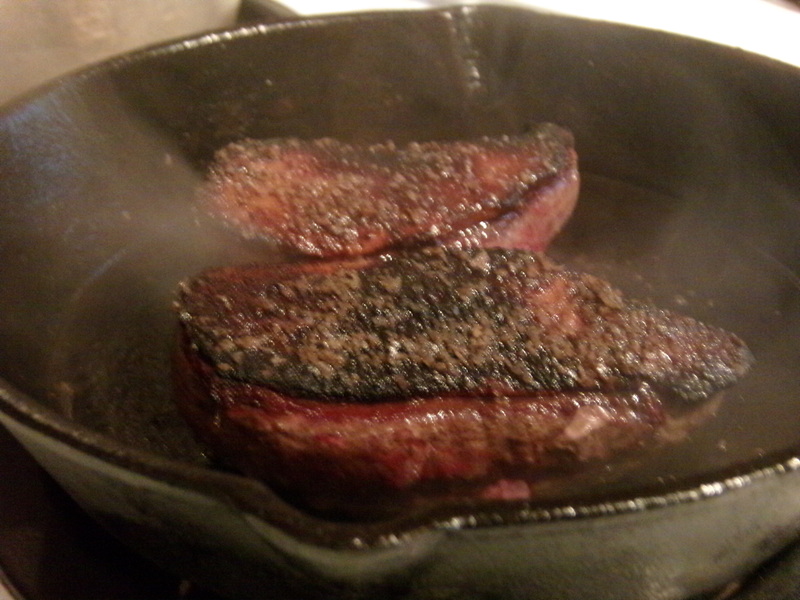 Wild Food: Hunters Eat Salad, Too. There hasn’t been a lot of action around the house of late. Matt’s pushing really hard to get things done on the Ditch Boat (to the exclusion of every other task but work), and en route to Milwaukee a week ago Sunday, my kayak rack blew off my car on I94. Excellent. No outdoorsing for us, really. This past weekend, we were invited to a 4th of July party thrown by the family of one of Matt’s college buddies. 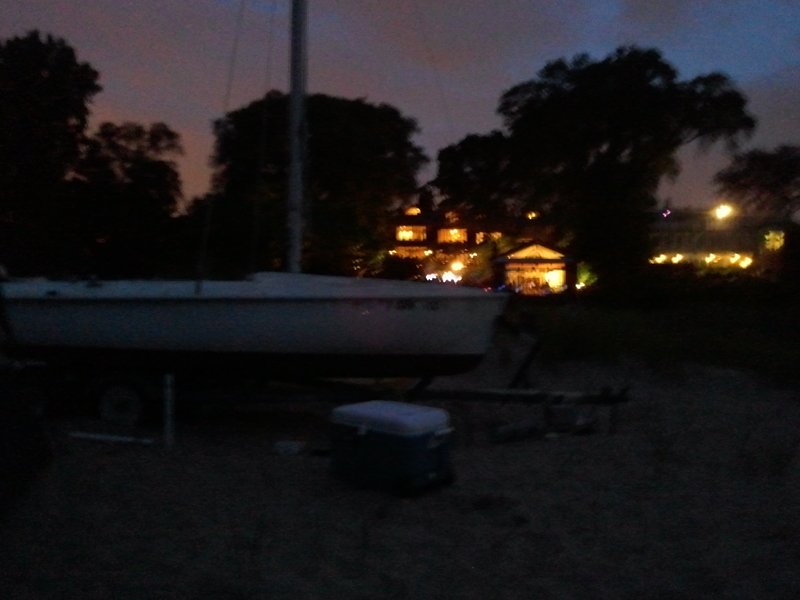 It was down in Wilmette, Illinois on Lake Michigan. I contemplated bringing a fishing pole, but opted not to. 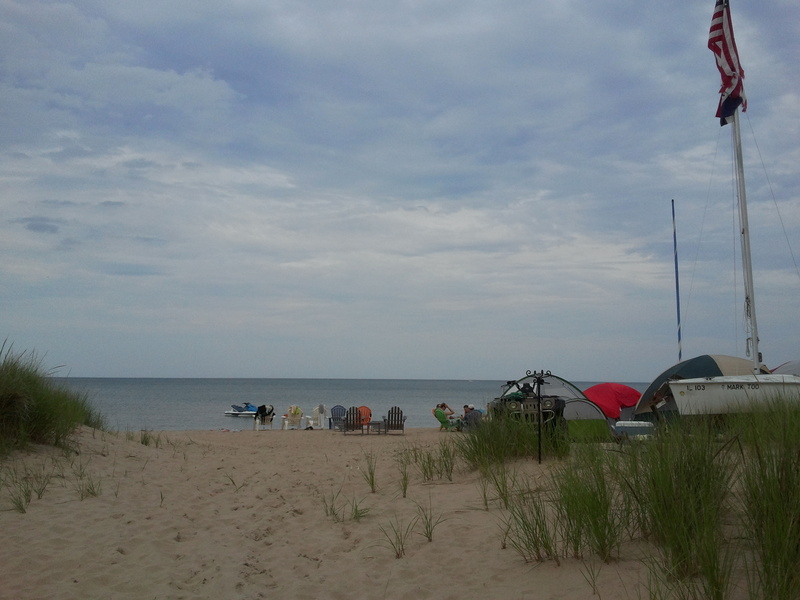 We ate and socialized, and camped on the beach. It was a pretty decent time. 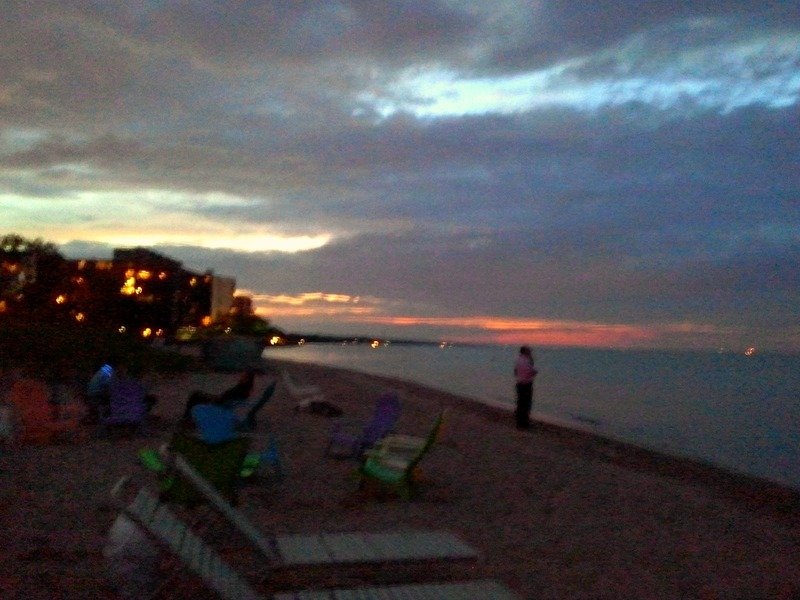 Lake Michigan under steely gray skies. 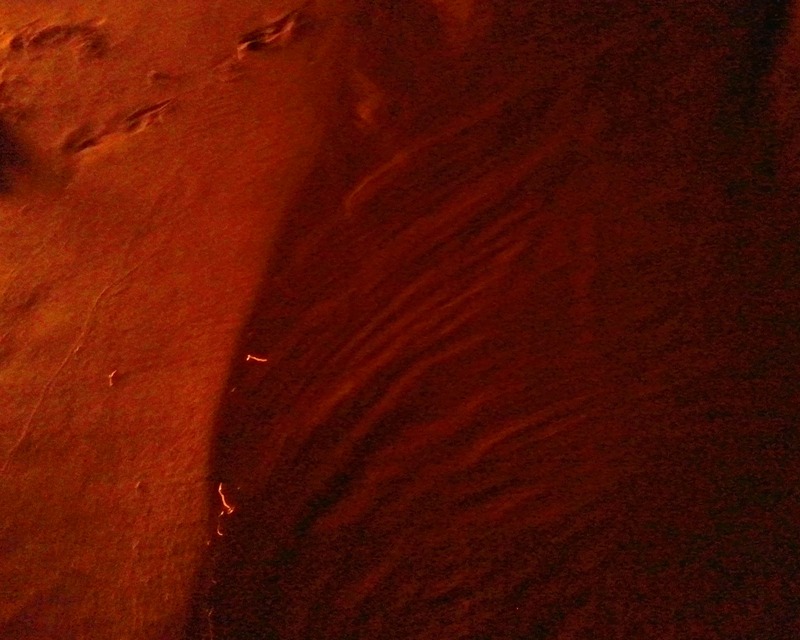 Waves by firelight. The lake water is definitely still cold. Sources say about 45-50F, with some areas in the 30s. So, when we got back, Matt dove right back into doing his work on the boat (of course). I did a bunch of yardwork, and decided a nice, light dinner was in order, after Maxwell Street Polish, hotdogs, and french fries all the night before. 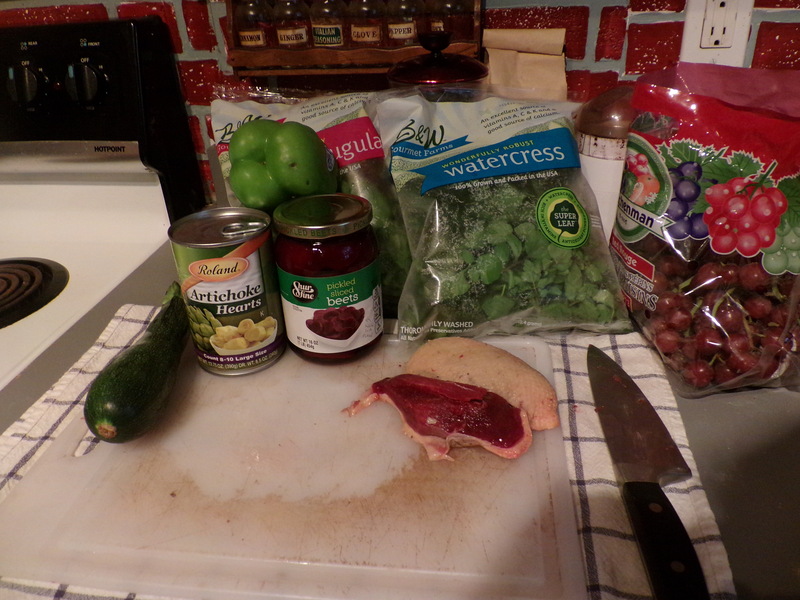 So after looking around at a few recipe ideas, I set out the last duck we had from last year, and picked up salad materials. 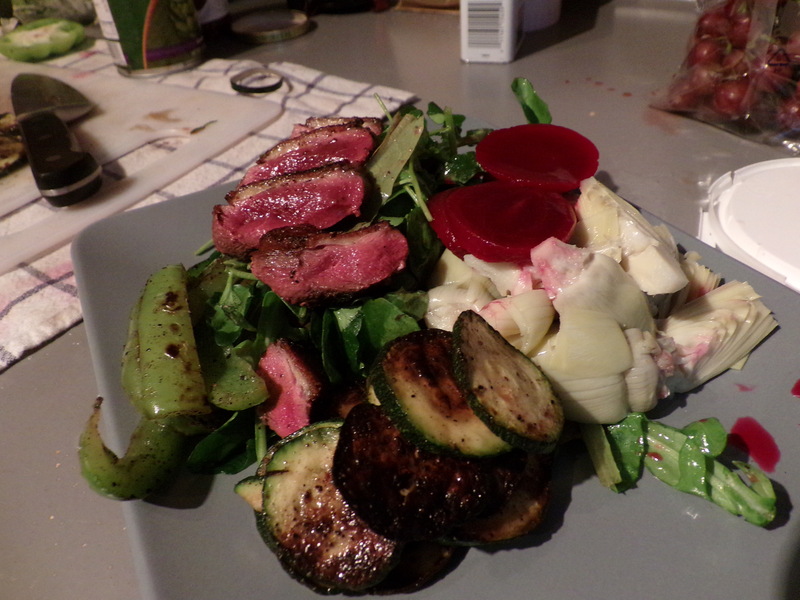 Arugula, watercress, duck breast, green pepper, zucchini, artichoke hearts, pickled beets. I started with watercress to go along with the idea of “if it grows together, it goes together”. I added the arugula because I like it. I also threw in some baby red leaf romaine from the garden. 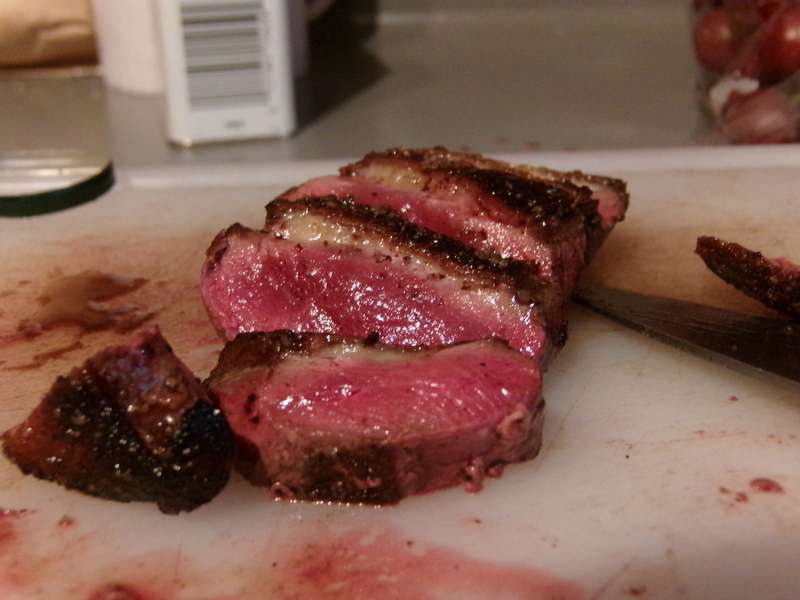 So I had to sear the duck, the zucchini, and the peppers. The skin turned nice and crisp. After that, it was time to assembled the whole lot. I went with a nice, simple olive oil vinaigrette for dressing. I like my salads to be loaded down with other veggies. It was good. I had seconds. I’ll probably have more for lunch today, too. We’re really hoping to make it down to Illinois again next weekend, only this time to my home town. We’re planning to go back after asian carp in the Illinois River. 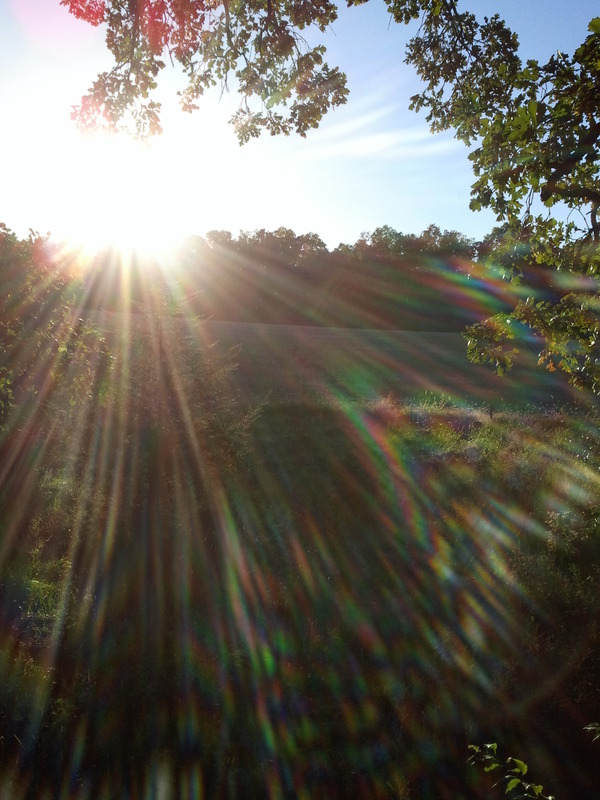 This morning I’m coming off the first three days of my Spring turkey season. So far, I’ve watched a herd of deer get absolutely terrified by my turkey decoy spinning in the wind (Wednesday), I’ve spooked the entire flock (yesterday), and then watched the turkeys come off their roost and do a bit of grazing, about 200 yards away from me (just this morning around 6:15). I’m giving myself points for at least getting to watch the birds this morning without scaring them off. Tomorrow morning, Matt will be going out with me. I have until next week Wednesday to bag a bird unless I want to purchase extra permits. As I sat on a composting pile of leaves and clover straw this morning, one of the things I was thinking about (besides hot coffee and doughnuts) was my very first encounter with wild turkeys. The first time I ever was aware turkeys could be wild and not just on the table at Thanksgiving was when I was little. 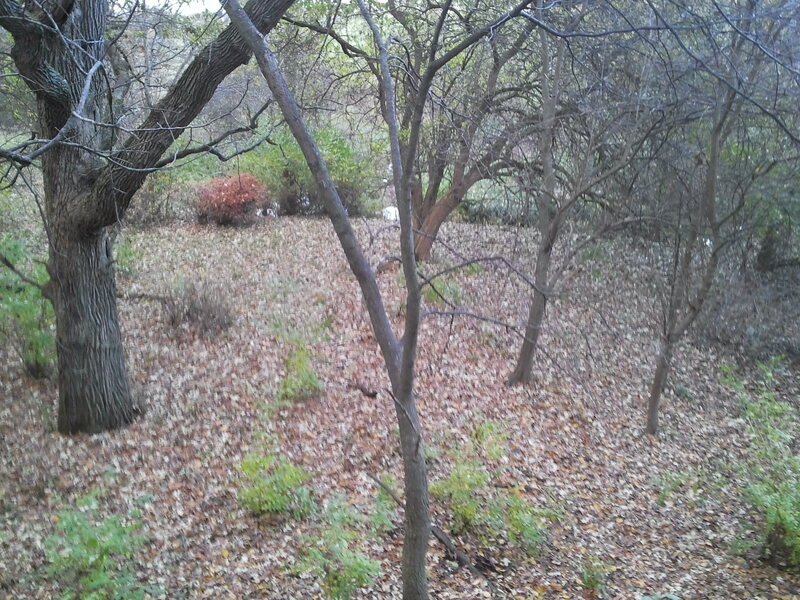 I think I was maybe 6 or 7 or so, and we still had the wooded lot my parents owned, which I’ve described before. We were out there one Saturday in early Springtime, and both my parents were doing some clean up work. What’s important to know here is that wild turkeys had been hunted out of Illinois in the early 1900s. The last wild turkey sighting in Illinois was 1910. The state began reintroduction projects in the 1950s, but that was mostly in the Shawnee National Forest, some 4 hours to the south of where I’m from. So, not even my dad had ever seen a wild turkey. Or probably even his dad. The last relative of mine whose name I have and who may have seen a wild turkey, or at least been around when they were still in Illinois is my great-great Grandad Herbert Robert Ellis, or his dad Reuben Robert. Possibly my great-great Grandma Priscilla or her dad and brothers- they all hunted, too, down south by the state line with Kentucky. But I digress. Unbeknownst to us, our local conservation club had signed on for some repopulation efforts in our part of the Illinois Valley. They had done some wild trap-and-release with moderate success, but for some harebrained reason, they also decided to hand raise some turkeys. But they didn’t limit human contact with the birds. That brings me back to, well, me. 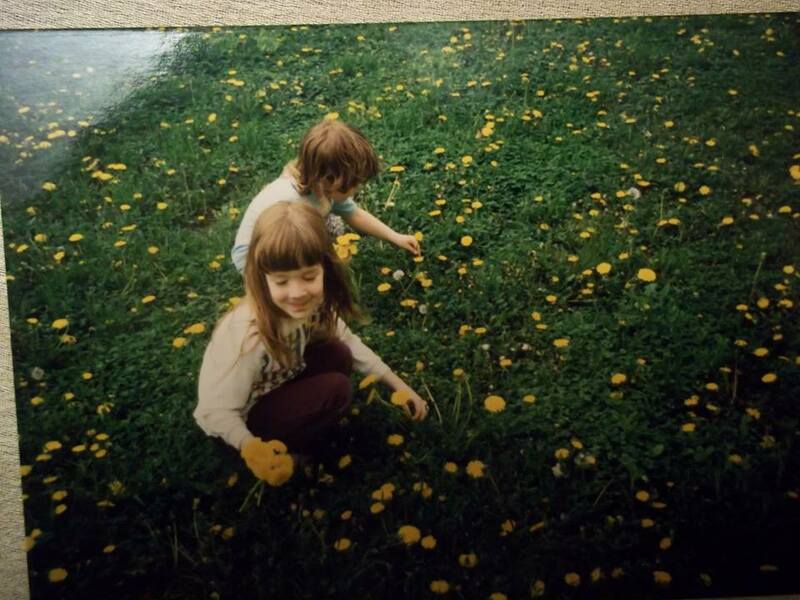 Me and my kid sister, wandering and playing while mom and dad did some clean up work. We were towards the back of the property in the trees. In the Springtime, there would be a massive hatch of ladybugs. They would cover the entire ground and the bases of tree trunks. One such hatch was happening that day. Suddenly, we look up from our play to see a big, dark shape moving through the trees. It had two legs, and it bobbed its head as it wove between the tree trunks. It pecked the ground eating ladybugs. It was also coming right for us. Somehow, we had the presence of mind to calmly walk away in an attempt to escape, instead of running in terror at what was obviously some sort of dinosaur come to devour us. We hurry away, it follows us. We hurry a bit farther, it still follows us, and it’s getting even closer. Finally, we give it up and run in terror, my full-blown dinomania convincing me that the kitchen scene from Jurassic Park is about to commence. We find my mom picking up some litter up closer to the road. My mother eyed us skeptically. We always had been imaginative children. “There are no giant birds in Illinois.” she said, “Now go and play, your father and I are busy”. As she turns back to her task, dinobird comes strutting around a brush pile. Mom drops everything in her hands and hollers at the top of her lungs “OH GOD JOHN GET OVER HERE THERE IS A GIANT BIRD AND IT’S CHASING THE GIRLS!” Not only had mom never seen a turkey herself, but a few bad experiences with mean roosters and parrots have given her a lifelong fear of birds. Dad came running. I mean, giant terror birds, right? But he’d seen pictures, if not the genuine article. When he sees dinobird, he laughs. “It’s a turkey!”, he exclaimed. Dinobird reduced to a holiday dinner course, it was much less frightening. We assumed it had been hand raised with little to no fear of humans. It was probably looking to be fed, honestly. 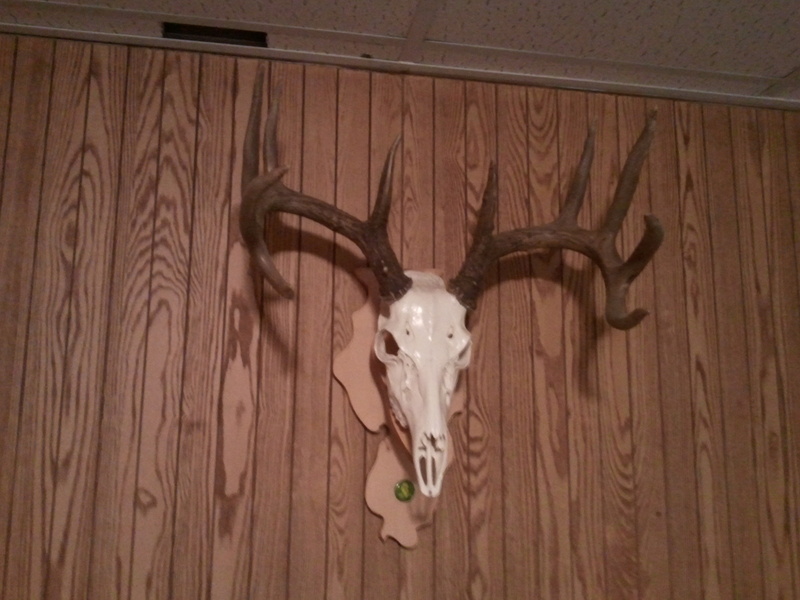 However, after that, it was all we could do to convince my dad not to wring its neck and toss it in the pickup truck. Funny, considering how desperately I want a gobbler in the back of the truck nowadays. A month ago, I didn’t have a pen or paper to hand, much less the will to sit up in the dark, fumble with the lantern, and wake up my boyfriend. I also haven’t taken the chance yet to sit down and write anything about it. But I started this October tenth, around 9:30 or 10 in the morning. I’ve cleaned it up about as much as a post this length could be. We also just had our first good freeze last night- it dipped into the 20s. This week won’t break out of the 40s. Our (gas) heat’s been on for over a week now. This seems appropriate. It was late. We’d just arrived back at the cabin after eating at a bar in town, gotten a fire going, and blown out the Coleman lantern. I was lying in the bunk, inside my sleeping bag, waiting for sleep to come. The smell of dry firewood catching in the wood stove permeated the cabin as the fire crackled and popped into life. It isn’t just campfires that spring to mind when I smell wood smoke. 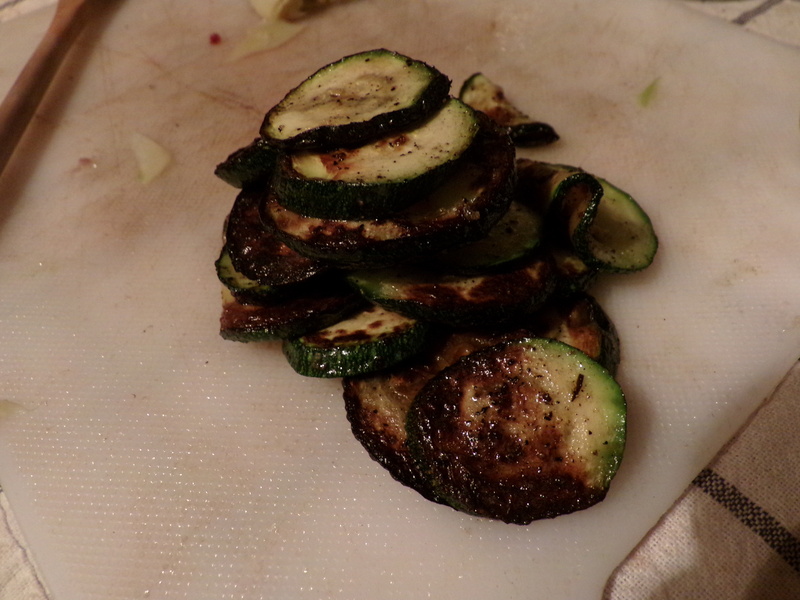 Or grilling, though both of those things are there in the background. The house I grew up in had central gas heat. But we never really used it. In fact, sleepovers at grandma’s, or at friend’s houses, my mom would warn us to pack sweatshirts and thick socks with our warm jammies. We wouldn’t be used to the 50-60 degree temps in houses warmed by electricity or gas. Our house was a steady 75+ degrees. And dry. We never had a problem with mold or mildew, especially in the basement. That’s a problem I’m still slightly perplexed by it when it happens. The floors were always warm. The smoke stained the walls, though. My grandfather lived in the hills in Kentucky in the warm months. It was the middle of nowhere. He had electricity that he used sparingly, and no plumbing. He loved it. But as he got to be an older man, he couldn’t get around as well in the winter. Never even mind that George had smoked Lucky Strikes like a chimney for 30 years after leaving the Army once World War Two was over. He had emphysema to boot. So, in winter, he would spend time at his daughters’ houses in Illinois. When he stayed with us, he didn’t mind taking the spare bedroom in our unfinished basement in the least. It was warm as could be down there. Our house wasn’t big, fancy, or all that pretty. My hometown had been a coal mining town when it was founded in the 1800s. The mines had been just outside of town, though town would eventually grow up around the mine shafts when they closed. In fact, just down the road from us, one of my childhood friends grew up on Shaft Street, which had one of the only steep hills in town (Illinois, remember)- it was a boarded up, back-filled mine shaft entrance. It was fun to ride our bikes down. Our house had been a coal miner’s shack. Only the kitchen was original; it had had a basement dug underneath it, and the livingroom, bathroom, and two bedrooms added onto it. It was sided in pebbledash stucco. The front porch was a concrete slab that was slowly collapsing. My parents bought that little house when I was two, right before my younger sister was born. It was on a double lot- right around an acre of land, even though we were in town. The house came with a tree trimming and felling business. A big, yellow, aluminum Morton building at the back of our yard housed an old, white GMC boom truck; an ancient International dump truck and the industrial sized, yellow Eureka wood chipper it pulled parked in front of the shop. Dad would add to the collection of Stihl chainsaws and old dump trucks, eventually purchasing two smaller trucks: an old red Ford that ran like hell, when it wasn’t running entirely too rich, and an old red Dodge, which had a gas tank so rusted on the interior that my dad and his crew would take extra fuel filters with them on jobs outside of town, and swap them out on the side of the road. He got the dump trucks from salvage, making them run again with trial and error and memories of high school auto shop. He also maintained the old GMC and the International. He could stand up inside their engine cavities to work on them. We joked that they were all Flintstone trucks- the floorpans of the cabs were rusted through in places, and when we begged my dad to accompany him when he dumped the wood chips and mulch, we could see the road passing underneath us as we drove down the road. He would let us control the hydraulics of the truck beds at the dump sites sometimes, too. I learned to steer sitting on his lap in those big old trucks. The wood Dad hauled home from other peoples’ yards in those ratty old dump trucks was our heat. The tree trunks that were straight enough came back intact, and dad would sell them to a guy with a mobile saw mill. But the branches and other assorted chunks would be chopped to heat the house in cold weather and be grill wood in summer. Large branches and chunks were placed on the diesel log splitter, and once they were more manageable, Dad split them by hand with his maul. I can remember playing outside in the Fall and Winter, out of sight of Mom in the house, behind the International and the yellow building. Dad keeping an eye on us while he chopped- set the piece upright, wood grain perpendicular to the ground, lift the maul overhead, pause, swing, chop, thunk. The two smaller pieces would fall to either side. Helping him to stack it into piles. Covering it with tarp. We would run after or alongside him in the afternoons and evenings to stack firewood into the beat up old steel wheel barrow, and try to keep up as he pushed it, bumping along, up to the house and carried the wood downstairs. I remember him building the fire up to burn through the night, and I remember hearing him waking up before dawn every morning, starting coffee and clumping downstairs to build the fire back up. Through the floor and register: the creak and groan of the stove door opening, the clunk of firewood being tossed onto the coals, and another creak and groan before the door banged shut. He remembered getting up as a child to go milk cows in the winter, without having a fire going yet. He hadn’t liked it. We would come in from playing in the snow: snow suits, boots, mittens, socks all soaked. The wood stove was tucked into a corner behind the wooden staircase for the basement. We’d leave all our wet clothes on the steps in front of the furnace. They would be dry in an hour. Sometimes, we’d have weenie and marshmallow roasts in the middle of winter over the fire. At Christmas, my parents put our letters to Santa into the furnace, telling us they flew up the chimney and to the North Pole. We were gullible kids. Most winters, the snow within two feet of that corner of the house and the chimney melted away to bare ground. 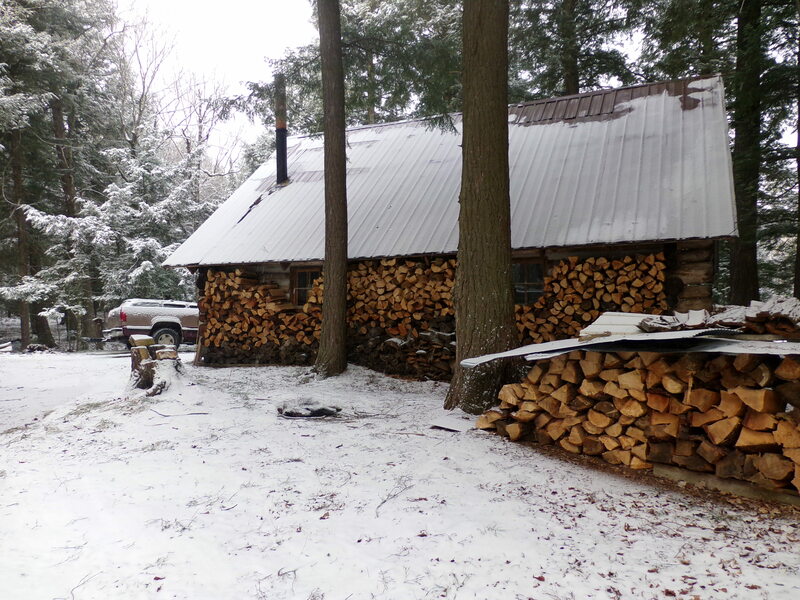 Our favorite wood to burn in the winter was dense, hard oak and hickory. I can still pick out oak and hickory smoke when I catch a whiff of it. Someone on our street here in Madison has a wood-fired stove, too, and sometimes they burn oak. That chilly October night up in the Northwoods of Wisconsin, 419 miles from where I grew up and lived most of my life so far, we were burning oak and hickory. The sharp, clean smell of the dry wood burning tripped old memories in that hazy space between wakefulness and sleep. I was warm, and my wet clothes were drying on the steps near the stove. Back to the Flatlands for a Weekend. I spent the past weekend down in my hometown. I ended up driving down on Saturday morning, since I got off so late. I had been pretty excited to hunt down there. It was worse when I saw all the heads on my mom’s friend’s wall-all off this land. It’s corn and bean, with a pasture, and it’s right on the river. So, we went out Saturday afternoon. 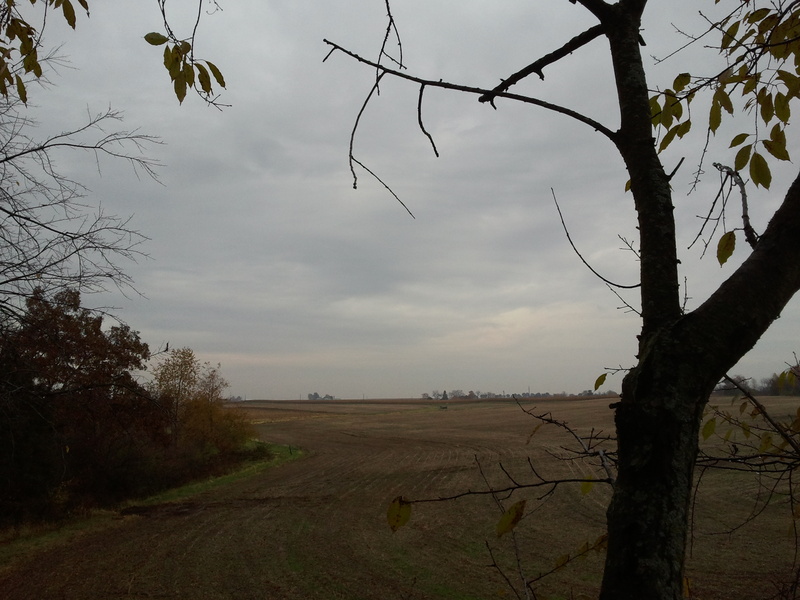 He put me in a west-ish facing stand, on the edge of a bean field, in a huge burr oak. 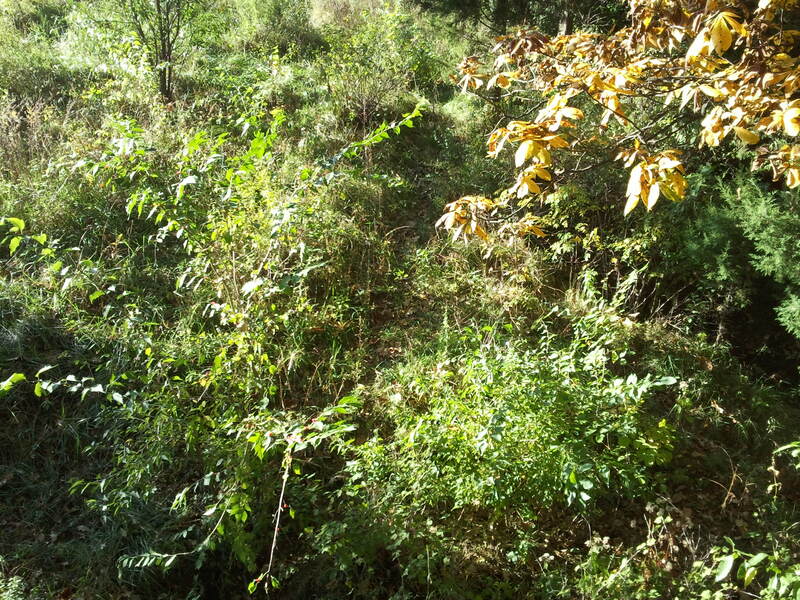 I had a draw at my back- a trickle of a creek running down to the local river at the bottom of a cow pasture. 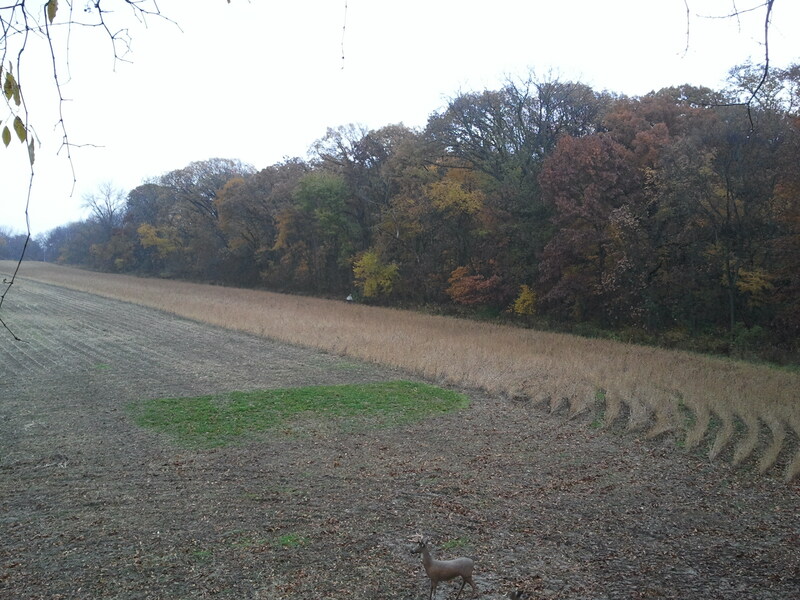 He said he saw deer walk back there all the time, as well as through the field. Barn across the road behind us. As the sun went down, it sucked. Sadly, we were both skunked. Not even any eyes reflecting at us at night when we left. My guess was that the bean field recently being cut, plus some people camping on a very small campground nearby pushed them out. It was also the youth gun hunt- I heard shotguns not too far off. However, my tag is good for the rest of the season. I hope to make it down again in a few weeks to try again. Disregard the car. I pulled off the highway to snap some pictures. A little video, and good news. Did I say this afternoon? I meant tomorrow. Definitely tomorrow. This is the video of grouse hunting, and I apologize in advance. We still haven’t got the new camera entirely figured out. It takes video in both 1080p and 720p HD. This was the first video, and I didn’t change the settings, so it was on 1080. It’s jumpy, to say the least. I was also really hoping it would capture the sound of the bird flushing out, but it didn’t. So sadface there. But it’s still a neat video. In other exciting news, I talked to my mom on the phone yesterday. I’m driving down Friday night for a visit, which would be cool all on its own, but she told me we’d be getting some family photos done. And that if I picked up a non-resident tag (after living in Illinois for 23 years! 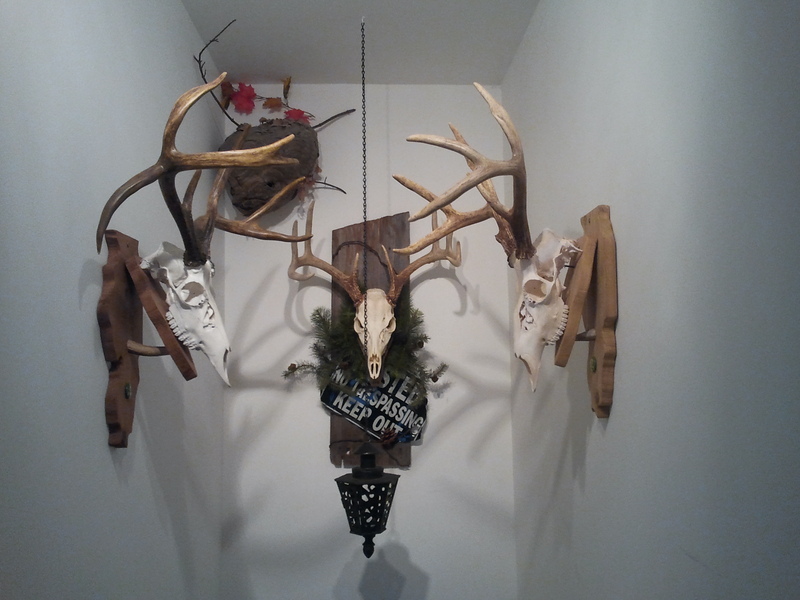 sheesh), a friend of hers wanted to take me hunting on some land just north of town. I mean, I had that morose feeling that accompanies repeated failure and disappointment. But that perked me right up! 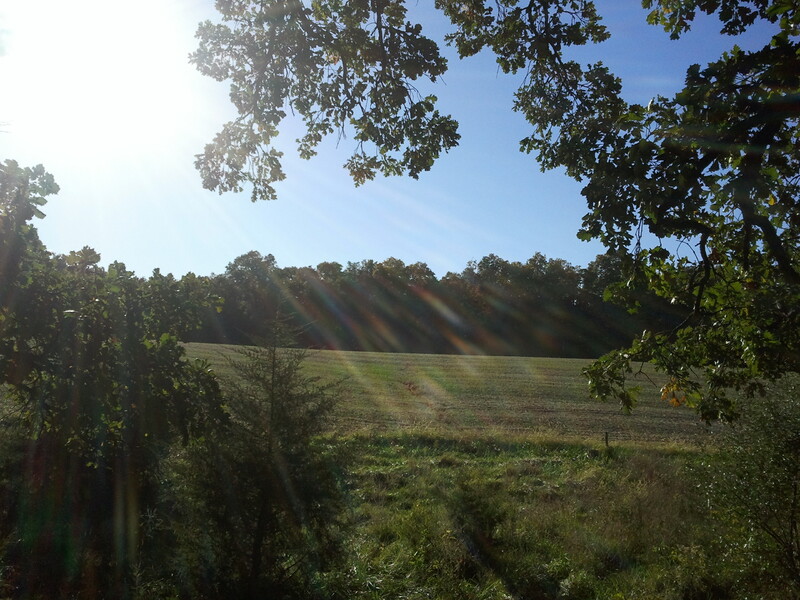 Hunt in the area I grew up in, where my dad used to take me, once in a while, if I was very, very good, and promised to be very, very quiet to sit in a tree stand with him, and hope for deer? Yes. 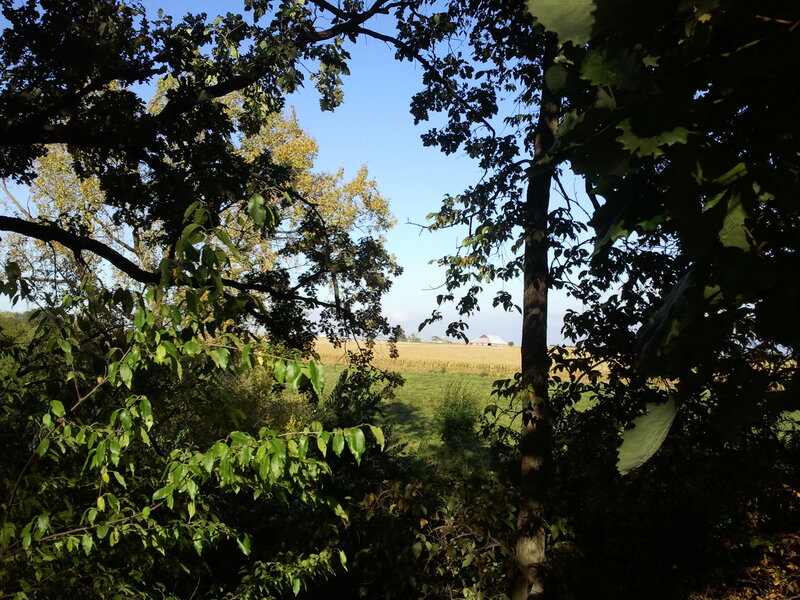 She told me where the land itself was, and it happens to be near 1. the local, big state park (Starved Rock, if you’re curious) 2. the conservation area maintained by the local sportsman’s club (Sandy Ford), and 3. 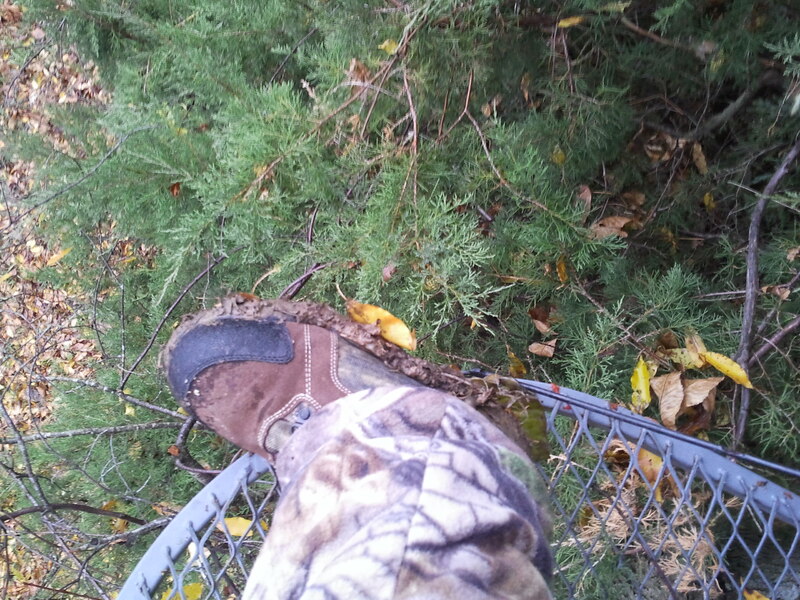 Pretty close to where we were when my mom hit an approximately 200 pound 8 pointer with her truck. 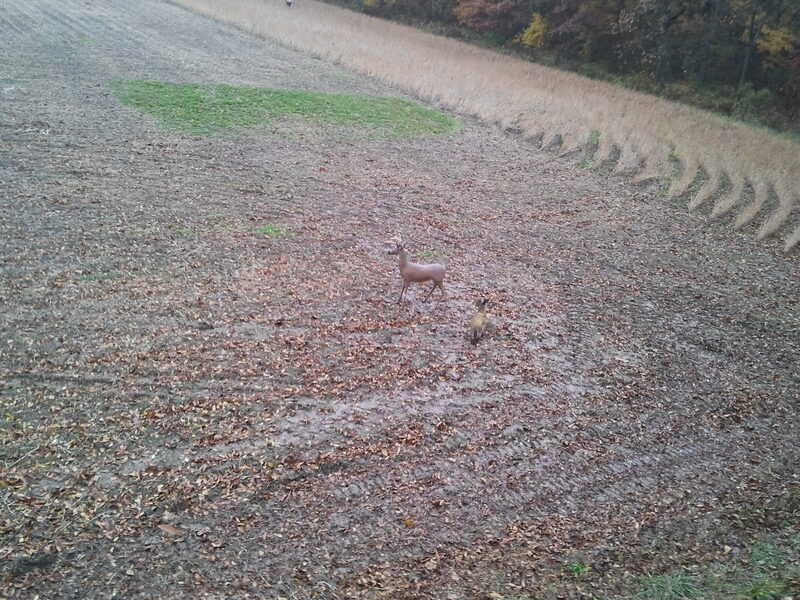 That was pretty scary to be a part of, but there’s big deer there. Furthermore, Matt’s hoping to set himself up a hunt out west of Madison in Dodgeville while I’m gone. All in all, I’m pretty excited. I’m planning to bring a couple small gifts for my little nephew, and a (very, 6-month) belated birthday gift for my sister. And I’m buying him his first camo shirt just to mess with his mom. In addition to all my hunting camo, my bow, and a target. Mom has an old swing set in her (large) backyard, and I can shoot from the top of it for practice (which I sorely need).